Mission Statement The primary focus for Sedona Toys for Tots is the collection and distribution of toys to less fortunate children of the community at Christmas. Sedona Toys for Tots works with local social welfare agencies, church groups and other local philanthropic organizations, to register and complete the distribution of toys, books and bikes to children of the community. 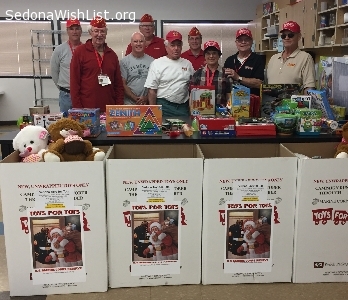 The Sedona Marine Corps League Detachment 1237 sponsors Sedona Toys for Tots because the Marines believe that every child deserves a little Christmas! Services and Projects Distributing toys, books, stocking stuffers, bikes and helmets to less fortunate children in the Sedona area ages 0-14 years. Volunteers set out toy collection boxes in 45 local businesses in Sedona and West Sedona in early November. The toys are then collected, sorted and bagged for each family. Individual families can call or register online. All the local Sedona schools (public and charter), Sedona St. Vincent de Paul, Sedona Community Food Bank, and Verde Valley Healthy Families register needy children for Toys for Tots. We also serve Oak Creek School in Cornville and Beaver Creek Kiwanis. Approximately 80% of the children we serve live in the Sedona - Oak Creek area, with the other 20% living in the Verde Valley area. In our 2017 campaign we distributed a total of 4,767 toys, stocking stuffers, and books. Most toys are delivered by the middle of December before the school’s winter break. Each child received approximately 2 - 3 toys, a stuffed animal, a game, a book to read and several stocking stuffers. For the first time in 2017 parents could participate in a drawing for bikes for their entire family. We provided bikes and helmets to 32 children. Coconino Safe Kids program provided 10 helmets and offered the rest for a reduced price. We coordinated with Verde Valley Cyclists Coalition who assembled the bikes. Our goal is to increase the distribution of bikes and helmets this year to 75 bikes. Santa’s Elves have been busy, our secret workshop is overflowing with toys and good cheer. Toys for Tots donation boxes will have their final pickup on Thursday, Dec. 13th. But it’s not too late to donate a new unwrapped toy, book or stocking stuffer. The Sedona Fire District will be collecting toys in front of Clark’s Market and Safeway on Saturday Dec. 15th from 9 to 3. Stop by and make this Christmas the best ever for the children of Sedona! Sedona Toys for Tots is on their way to bringing bicycles and toys to the children of Sedona. Two bicycles have been donated and many, many toys. Also a large monetary donation was given to help purchase 8 more bicycles!! We have until December 13th for our toy drive so keep up the good work! !